Chimerigen is a biotechnology company which develops, manufactures, and markets high quality, leading edge products for biomedical research. The company leverages its technological strengths to develop innovative reagents for biomedical research. Chimerigen manufactures unique immunoglobulin based chimeric fusion proteins and their related research products using advanced cellular and molecular biological techniques. These reagents are used successfully in basic and applied research. In addition, Chimerigen provides high quality service to produce and purify customized proteins. Chimerigen guarantees customer's satisfactions. Moreover, Chimerigen protects customer's right on their proteins. There are two types of IL2-Fc. Both forms are a soluable 97kDa dimeric fusion protein consisting of mouse IL-2 fused to natic or mutant mouse IgG2a Fc. Nonlytic IL-2/Fc acts as long-lasting IL-2. Lytic IL-2/Fc not only binds to IL-2R, it is capable to mediate ADCC and CDC immune effector mechanism to target IL-2R positive cells. The potential clinical application of cytokines to modulate immune response is very high. Unfortunately, most cytokines have short circulating half-lives. 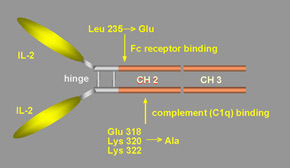 With the creation of a group of new immunoglobulin- based cytokine fusion proteins, in which a cytokine sequence had been genetically fused to the hinge, CH2 and CH3 regions of an immunoglobulin, these cytokine fusion proteins possess both the biological functions of the cytokine moiety and the prolonged circulating half-life determined by the Fc domain.